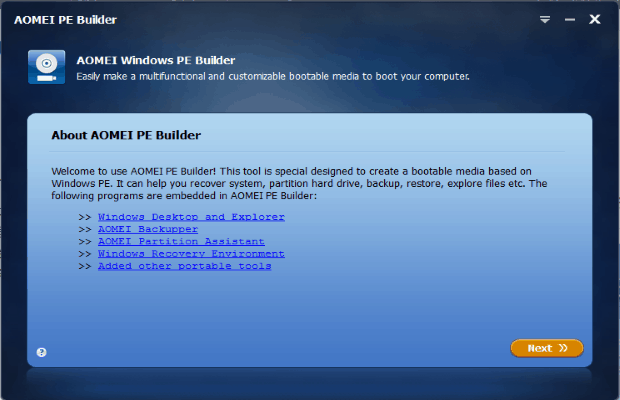 AOMEI PE Builder is a free tool to create bootable environment based on Windows PE. The biggest advantages of it is that its installing does not need AIK/WAIK. AOMEI PE Builder has many other advantages compare to original Windows PE and similar software. In this review, we will explain how useful it is in details. Create bootable media is a function in AOMEI’s famous products – AOMEI Backupper and AOMEI Partition Assistant, AOMEI PE Builder is a single tool, what’s more, it can make a custom bootable environment based on Win PE. 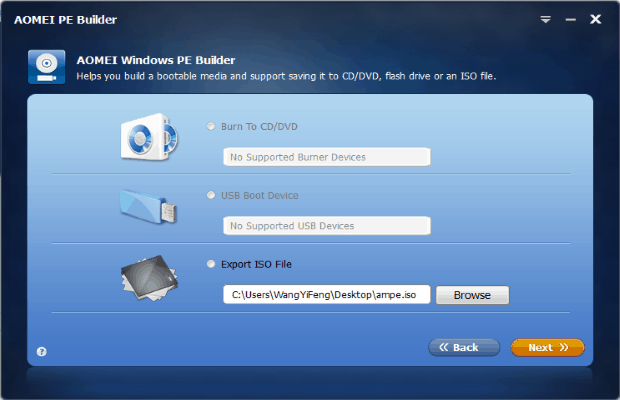 AOMEI PE Builder is used to make a bootable environment and media. When to use it? When your system can’t boot normally or can’t enter into Windows. You need the media and enter the environment to fix error or solve problem. AOMEI PE Builder is easy to use. Download, install and open it. The main interface is a brief. Click Next button two times to go to the first key step – choose utilities, add files and drives to build a DIY bootable environment. AOMEI Backupper Standard Edition and AOMEI Partition Assistant Standard Edition have been integrated by default. Applications depend on what you want to do with bootable media. Third step – choose a media. There are three choices: CD/DVD, USB or export ISO file. Select OK, click Next will start the creating task. Wait for minutes. Then, if your system encounter questions, the bootable media created by AOMEI PE Builder can come in handy. 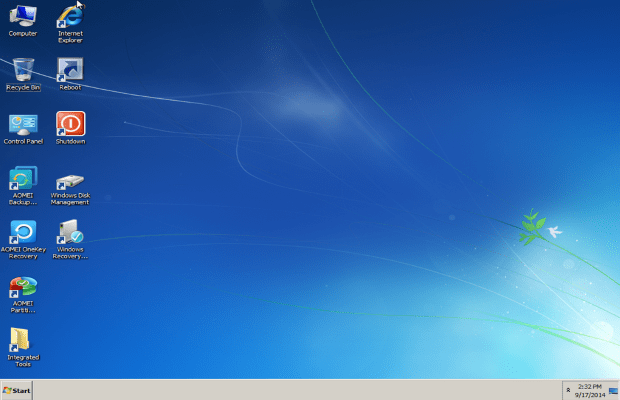 Connect the media to your device, adjust the boot order, enter in the PE as following picture shows: a familiar Windows 7 environment, contain desktop, Windows Explorer, start menu, taskbar and so on. Next, maintain your system or anti virus off-line, re-install the operating system or reset login password. In a word, in the bootable environment based on Win PE built by AOMEI PE Builder can do many things. Computer as a machine, we can’t predict when it will fail to start. With AOMEI PE Builder to create a custom bootable media is better to protect your system, you can fix errors immediately. It provides you so many choices that we think it is a great tool. Download from here and try please.